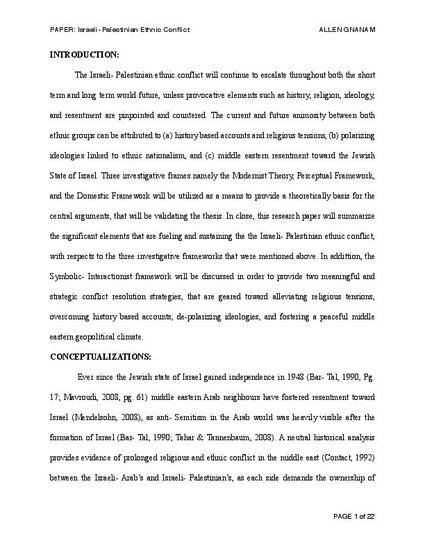 This research paper discusses the historical, religious, and ideological factors linked to the Israeli- Palestinian ethnic conflict, and how these factors have contributed to middle eastern resentment toward the Jewish State of Israeli.  The Modernist Theory, Perceptual Framework, and he Domestic Framework have been applied to the analysis of the Israeli- Palestinian ethnic conflict, in order to demonstrate the intensity of the above factors and their provocative role in the conflict. Other provocative issues that are discussed in this paper include territorial wars, ethnic nationalism, the competition for natural resources, the biased dissemination of historical text through educational institutions, and the role of the diaspora. In close, this paper utilizes the Symbolic Interactionist Framework in order to evaluate two conflict resolution strategies, that are capable of tackling and overcoming provocative factors that are sustaining and reinforcing the status quo Israeli- Palestinian ethnic conflict. This research paper provides a starting point for comprehending different ethnic conflicts as well as the Israeli- Palestinian ethnic conflict.